In the first part of this blog I wrote about how important increasing a donor’s loyalty is – the way they feel about your charity. This is the ultimate goal in relationship fundraising and to do it we need to know what drives loyalty. As a starting point I wrote about how important personal connection is to that. That’s all well and good if you’re a university, a health related charity or a local cause. But what, I have been asked, can you do if you’re not one of these? Is it still relevant? Because your job is to create a connection between the donor and your cause or, better still, your organisation – an emotional link to give them a reason to believe that your charity is important to them personally. Of course, you can’t just create a new cause, but can you present your work differently? Can you make your appeal local? Recently I received two appeals from national charities. 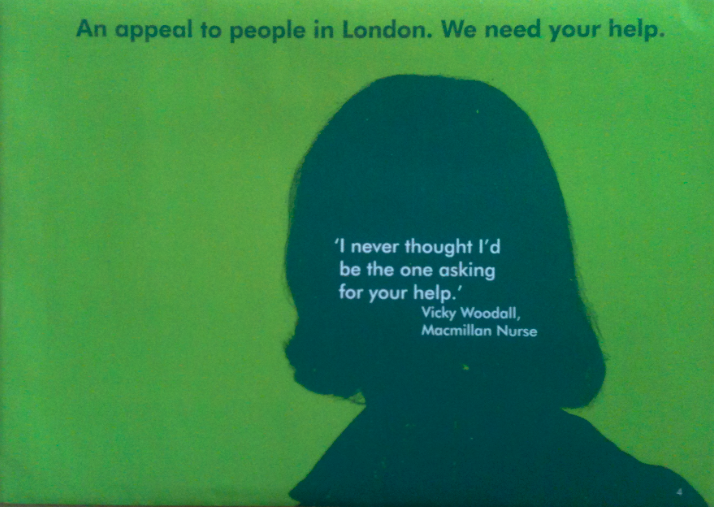 Macmillan Cancer Support asked me to support their services in London. Now I don’t live in London, so I have to question their targeting, but if I did then they would have an appeal that is relevant for my family and my community – the people that I love. 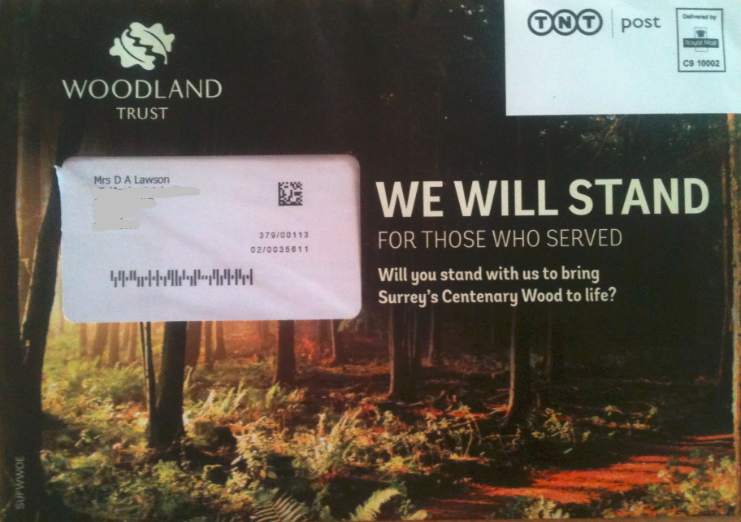 At a similar time the Woodland Trust proved they have better targeting by asking me to support the creation of a new Centenary Wood (to commemorate the centenary of the start of World War 1) just up the road from me. I enjoy walking outdoors, love woodland and (although they didn’t know this) earlier this year I visited the WW1 battle fields in The Somme and Ypres. For a national charity, I now have a local connection. And when I’ve visited the Centenary Wood (as I certainly will) I will have a personal experience. Can you create a connection between the donor and the beneficiary? I’ve talked before about the Baby Boxes for Bosnia campaign I ran for Feed the Children in the 1990’s. Besides being a brilliant ask, we gave people the chance to write a message of support – messages that we read. Some of the most touching were from mums, writing to other mums that they’ll never meet or know. “I don’t know what it’s like to live in a war zone, but I do know what it’s like to have a young baby” started one mum on her message. This wasn’t just an international aid charity helping people in a far away country, she felt a personal connection to the mum receiving the box. Not everyone has the direct experience of ill-health, abuse or poverty (or whatever your cause is), but I’ve been involved in successful appeals asking farmers and teachers in the UK to give to farmers and teachers in Africa and medical professionals to provide medical kits for flying doctors. Or maybe you need to create a product that links something we all do every day to your cause. I love the fact that I can twin my toilet with one in Burundi or Bangladesh. It’s up to you. Don’t just give up and say my cause isn’t relevant. Think about your donors, your cause and your beneficiaries. Find what they have in common and get creative. Your donors’ loyalty depends on it! Building donor loyalty is, I believe, one of the most pressing challenges our sector faces. As the cost of finding new donors gets higher and higher, it is about time we did something about the shockingly low retention rates that we all have. And if we’re serious about growing retention then we have to grow donor loyalty. But how do we do this? How do we change the way they feel about us to create that “feeling of support or allegiance” (as loyalty is defined)? We know a lot about the drivers of loyalty and in this, my first post in a series looking at these drivers, I’m focussing on arguably the most important of these (at least for some charities) personal connection. We know that often people give to you because of something that has happened in the donor’s life which means that your cause or your charity is particularly important to them. It’s why people give to their local air ambulance or the university they went to or the hospital where their daughter was treated; it’s why people who have lost someone they loved to cancer give to cancer research charities; it’s why older people tend to give to elderly charities and why Christians give to Christian charities. The experience has created an affinity. If these are your donors then you have a huge responsibility to them. You have a cause that is very important to them and you will be talking to them about issues that will often be very personal. And, at the same time, you want to develop their support and giving over time. Don’t make assumptions. A donor’s connection may be with the cause (e.g. cancer), the organisation that they received support from (e.g. Macmillan) or maybe the individual part of the organisation they received support from (e.g. the nurse or a ward). The person with the experience may be the donor themselves or a loved one and the outcome could be extremely happy or desperately sad. Everyone’s connection is unique to them because everyone’s experience is unique to them.Perhaps most importantly, everyone’s emotional response is also unique to them. It isn’t for you to tell these donors why they should support you – they have their own reasons. Prompt by all means, but remember that encouraging someone to think about why they support your work is far more powerful than telling them why they should. If they have told you why they give then talk to them about this. Many Livability donors (a Christian disability charity) have told the charity that they give because of their Christian beliefs. And Livability mentions this in appeals because it increases response. If they haven’t told you, create tools to enable them to think about it themselves. This could include writing down their story, either to share it as many do or to put in a private place and to look at in special moments (as Cancer Research UK did when people decided to leave them a legacy – the note sits with their will and will be a reminder should they ever look to re-write the will). Bringing people together and creating a sense of belonging is incredibly powerful when people have a shared experience. Membership is obviously a fantastic tool for this but there are many other ways as well. If the community doesn’t yet exist then create it yourself. When Addenbrooke’s Hospital launched an appeal to raise money for the Rosie (their maternity hospital) they created the Rosie Born facebook group. Anyone who had been born at the Rosie could join. And much of their fundraising was run from this group. The number of people with this connection may be small and exclusive so you need to tell those donors who give to you just how important they are to both you and the cause. In research with lapsed donors I often hear the phrase, “I didn’t think they needed me anymore.” You have the chance to make your donors know just how needed (and how special) they are. I know we’re talking about retention, but part of this is about bringing in the right people in the first place. Not everyone is going to give to you so don’t try to reach everyone. If you can target according to the personal connection (e.g. by location) then do. If you can’t then make sure that you are still writing for the connected audience – let those people who do have the relevant experience self-identify themselves to you. Emotion is essential in fundraising. You can successfully fundraise by understanding the donor’s emotional reasons for giving even if there is no experiential connection, but you won’t be successful if you use their experience without understanding the emotions involved. Personal experiences create a complex mix of emotions. People give to their former university because of pride and because of gratitude; in research I ran for Friends of the Elderly earlier this year I heard people talking about giving to elderly charities because they felt guilty about their own parents and grandparents; people give because of a sense of fear of what might happen when they get older; they might give because of the memory of someone they loved; they give in celebration of being given the all clear (and, again, from gratitude); and, of course, they give through sadness, or an angry determination that no one else should go through what they have. You have an immense responsibility in nurturing these donors’ giving. But if you do this in a way that allows the donor to feel that you are there to help them achieve something important to them then you will be as important to them as they are to you… they will feel tremendous loyalty to you… and they will stay giving to you for many years to come. This is the first in a series of posts looking at the different drivers of loyalty. If you haven’t done so already, do please sign up in the top right corner to make sure you receive them all. Our 3 top priorities: retention, retention, retention! Apparently retention is the new acquisition. All I can say is it’s about time too! The 2013 Fundraising Effectiveness Report (download here) found that for every 100 donors gained by the sector in 2012, we lost 105. In any commercial setting a company that was losing more customers than it was winning would be shut down. OK, that’s a US figure, but it’s not going to be very different in the UK. Perhaps the worst thing is that we’ve come to think that the high cost of acquisition, low retention rates and long payback periods are acceptable. As long as it pays in the end, all is OK.
Our answer to fixing retention is to think about the mechanics. “If only we can get them onto Direct Debit” we cry, so we send them more and more DD asks. Or a strategy of, “Surely they’ll give more often if we send them more appeals” leads to more and more appeals, regardless of the quality. Of course both these strategies work. A donor paying by Direct Debit will give more and for longer than one that isn’t. And by sending out more appeals you’ll generate more donations. For all I’m about to say, don’t forget the basics. But there is something missing from this. Research shows that even satisfied donors lapse. They simply decide that they will support another organisation without you ever having done anything wrong. Read that again. Strong feeling… support… allegiance! We need to change the way we think about donors. We concentrate too much on how much money they will give us before the financial year ends and not enough on how we are making the donor feel. We are excellent at measuring the effectiveness of our campaigns but we don’t measure the long term impact. From the comments I had after my talk with Nick Mason at this year’s IOF Convention, I struck a chord with many people. All I did was exhort people to measure the donor not the activity. To really understand not just the response rate to a campaign, but the impact that the campaign will have on the donor and their long-term giving. On their loyalty! Understanding the drivers of loyalty is key to creating a communications programme that grows loyalty and therefore value to the charity. I’ve been looking at this a lot recently. No-one has done more about this in our sector than Adrian Sargeant, and there is some fascinating and valuable research from the commercial sector too. Personal connection is vital, as is what Adrian Sargeant calls identification (whether the charity shares my goals or values). Research we ran at Cascaid showed the increasing importance of giving a donor a sense of belonging and there is the growing issue of offering a donor social capital or status. The list goes on. What’s important for one donor will be different for another. What’s important for one charity will be different for another. Retention of our donors is the most important issue that we face as a sector and building donor loyalty is the most important aspect of that. Over the next few weeks I am going to share my findings of what the drivers of loyalty are and show some of the best examples of how charities are tapping into this knowledge to build their donors’ loyalty. There are some brilliant examples. Watch this space. And if you haven’t signed up then please do to make sure you get them all.